Every element in the bathroom serves a functional purpose. Sinks and bathroom countertops are no exception, and putting them together makes the most of the limited space. Additionally, granite, quartz stone, or marble countertops up the ante in the esthetics department. Bathroom countertops tend to take the shape of the sink and the space available to it, but while the space is probably fixed, the sink is not. Different types of sinks can change the look of the bathroom countertops, even there is just space for a stand. Here are some sink types for bathroom countertops you can consider for your bathroom or powder room. One of the most popular and affordable sink types is the wall mount or handing sink. These are available in a wide range of designs and prices, starting from $50. You can even install it yourself if you have a drill and the plumbing is in place. There are two basic types of wall mount sinks depending on placement. One is flat-sided for placing on any wall in the bathroom. The other is the corner type, for snugly fitting in the junction of two walls. The corner type is ideal for tiny bathrooms and those with awkward spaces. Wall mount sinks suspend from metal wall brackets and does not require floor support. This will usually leave the pipes exposed, although some varieties come with a type of skirt to cover them. You can choose to put it at any height, depending on who is going to use it. You can even have two wall mount sinks to accommodate people of different heights. Some wall mount sinks come with counter space, or you can put in your own wall mount vanity. You can also build a countertop mounted on a base cabinet for storage around the wall mount sink. The important thing is to make sure the countertops have a durable top. A pedestal sink is also a popular choice for small bathrooms with awkward spaces. It is a classic with its graceful lines, so you will find them frequently in both old houses and new. The typical pedestal sink is actually two parts, appropriately enough the pedestal and the sink. You mount the pedestal on the floor where the pipes are to hide them, and provide the support for the sink. In some cases, the sinks hang on wall brackets, reducing the pedestal to a decorative feature, so technically these are not pedestal sinks. 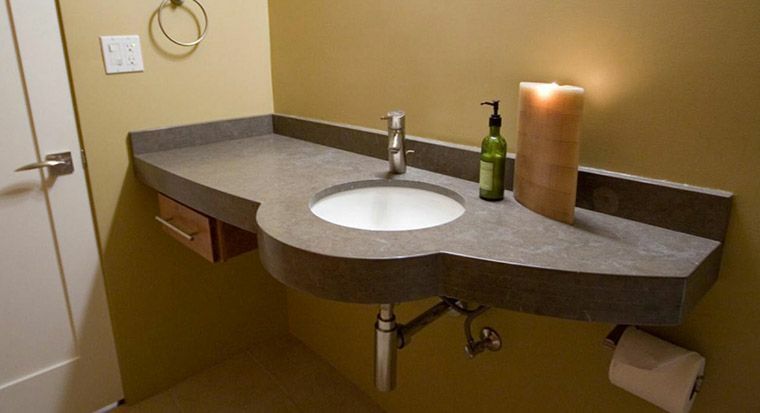 Like wall mount sinks, some pedestal sinks are appropriate for use in corners to use awkward spaces. You can install countertops on one or either side of the pedestal sink, or choose one with built-in countertops. You might not want to install a base cabinet for storage because it will hide the pedestal. A vessel sink is not a standalone sink like the wall mount and pedestal sink. This is usually a bowl of different materials equipped with a drain, and sits on top of a solid bathroom countertop save for a hole to accommodate the plumbing. Vessel sinks usually require a wall mount, deck, or other non-standard faucet and drain, so you probably need a plumber to install it for you. A bathroom remodel would be a perfect time for this, as the bathroom countertops will also require professional attention. Vessel sinks are functional, but their main purpose is decorative. You can find them in glass, porcelain, metal, and stone materials, and any of these works very well esthetically with granite and quartz countertops. It also helps that granite and quartz countertops can handle spills well, because vessel sinks tend to be a bit messy. Vessel sinks are not budget friendly. You can expect to pay a premium for vessel sinks, and some are very expensive. However, the price of some models is reasonable. In most cases, you want a cabinet base for your countertop supporting vessel sinks to provide storage. However, you can also choose a wall mount countertop, leaving the pipes exposed. If you choose this type, you want to ensure the pipes are suitably presentable. A rimmed sink is standard in many bathrooms, and typically requires a cabinet and countertop base to support it. The rim of the sink is considerably above the surface. Granite, quartz, or marble countertops would be the perfect base for rimmed sinks, as they look elegant and sleek. Rimmed sinks can be a single or double, depending on your needs. It comes in many shapes and materials, but oval and metal (cast iron or steel) encased in porcelain are the most popular for bathrooms. The cabinet component keeps the plumbing out of sight. A drop-in sink is similar to the surface-mounted sink used in kitchens. It is common in many bathrooms, usually paired with granite, marble, or quartz countertops. The countertops have a cutout for the sink, cut precisely to fit the sink snugly, allowing the rims to rest on the stone to support the sink. The sink may be made of porcelain or enamel coated cast iron or a lighter material. In the latter case, it may be necessary to clamp the sink down to prevent it from slipping out of the cutout. The under mount sink is more common in kitchens than bathrooms, but it is growing in popularity with bathroom use. This sink requires precise cutouts because it has to be wide enough for the sink, but not so much that there are extraneous spaces between the sink and the countertop supports. The countertop should go slightly over the lip of the sink. Since the sink mounts to the underside of the countertop, this has to be a durable material that is water resistant, such as quartz or granite. Marble countertops might not be a good idea for this sink type. An under mount sink may be one of many materials, including the usually cast iron or steel coated with enamel or porcelain as well as copper, vitreous china, composite resin, or stainless steel. This type of sink requires a cabinet to hide the underside of the sink as well as the plumbing. The bathroom requires a sink, and in most cases, countertops as well. Choosing marble, granite, or quartz countertops makes the sink area more functional as well as beautiful. When upgrading your bathroom, make sure you contract with a reliable countertop specialist to do the job. KNC Granite is a local company servicing the areas of Maryland and Virginia. We have a large collection of natural stones and engineered stones from which to choose for your bathroom countertops. You can check actual granite and marble slabs at our showroom in Lanham, Maryland. We also have representative samples for engineered stone from the top brands in the industry including Cambria, Caesarstone, Silestone, and MSI, all of which come with manufacturer warranties. We do not only supply top-quality stones, however. We are experts at fabricating and installing kitchen counters or bathroom vanities. Also we specialize in bathroom upgrades, delivering on time and on budget.